Yasuko Furuta, the designer behind Toga, studied at the École Supérieure des Arts et Techniques de la Mode, or ESMOD as an acronym. Despite the label being on my watch list for three seasons I didn’t know this. A quick Google search, and an ELLE.com article later I scrubbed up on my knowledge. Toga was first displayed in 2001, 14-years-ago, at Tokyo Fashion Week in Japan. The labels fans include Katy Perry and Chloe Sevigny, who have both worn her multi-buckle ankle boots. Susie Lau of stylebubble.co.uk often wears and preaches about the Japanese label. There is a lot to love about Toga. For the label’s first on-schedule show, Furuta showed at The Wapping Project Bankside, right by the Topshop Show Space in the Tate Modern. For Spring 2015, Topshop had moved to a warehouse on Grey’s Inn Road. Around the corner, the Toga presentation was held at the St. Pancras Renaissance Hotel. Once again, this vanishing act was performed and the Toga presentation reappeared near the Topshop Show Space at the Tate Britain, by showing at the Chelsea College of Arts. Before or after the Topshop show, the fashion crowd can mosey on into the Toga presentation and enter a world, slightly less commercialistic and far more visceral than many other shows during the week. 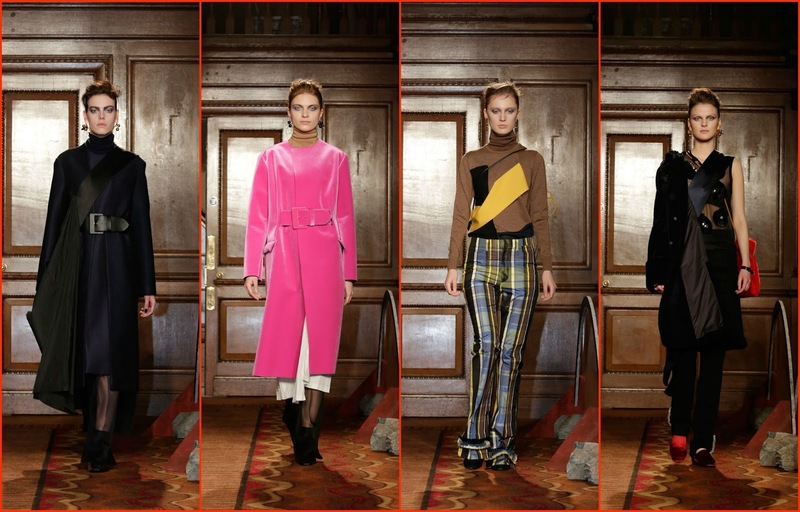 For Fall 2015, Furuta looked to the 1970’s. Blatant examples would be the checkered, flared taffeta trousers, and matching tops. One brown, yellow and blue pair were festooned with delicate embellishing at the ankle, for some extra pizzazz. Heavy eye make-up, and frizzy up-do’s were also worn. The first look resembled a fashionable Darth Vader ensemble. A navy belted trench over a navy dress. Cross-body, an olive green sash jacket-worn-as-sash finished off the look. Another look also had the outerwear turned into accessory look. A shearling-lined aviator jacket was made into a bag. These multipurpose garments could be considered wacky by some, practical by others. I’m somewhere in between. However, it is this chaos that Furuta’s designs are synonymous. This season I found calm in the chaos. Yes, a huge double-breasted pearly white fur overcoat was paired with a satin turtleneck and pink trousers and it may have been slightly complicated. The outfit looked better and more personal with the full-to-the-brim styling. Cream trousers with embellishments, milky brown sweater, cross-body bag, fur pelt, black satin sash, lots of accessories. In theory that sounds like a fashion experiment gone wrong. In person it was beautiful. The Toga woman may be leading a chaotic life but she is rather composed. In my review of last season’s collection, I wrote that I preferred to look at the outfits as singles rather than as a whole. Clearly, my naiveté (and my primarily minimal inclinations) clouded my judgement and revisiting that collection, my thoughts had percolated and I realised I loved it far more than I did ten months ago. Looking at Fall 2015 through a different lens than I did last September, I appreciated the collection far more. Toga was a tentpole on the Sunday of LFW. For Spring 2016 it will embellish the Tuesday with its amazingness.